Don’t know what parkrun is yet? Taking the world quite literally by storm, parkrun is a series of 5k runs held across the UK in areas of beautiful open spaces. With their increasing popularity, we’ve created a list of some of our favourite parkrun’s around the region. The world wide hist musical comedy The Book of Mormon is coming to Manchester! Find out dates and book your tickets here. Discover Manchester with a 90 minute bus tour. The 15 stop hop-on hop-off tour takes you to Manchester’s key sights and runs every day apart from Christmas Day, Boxing Day, or New Years Day. Find coach, rail and self-guided day trips and excursions from Manchester to Chester, The Lakes, York and more. Welcome to the official tourism site of Greater Manchester where you can search for things to do and find out what's on, as well as getting inspiration for your visit to this fantastic city region. Youthful, diverse, energetic and bursting with character; Manchester is one of the most exciting places to visit in the UK right now where everybody and anybody is very warmly welcomed. Known throughout the world as the birthplace of the industrial revolution, Manchester has a proud history in science, politics, music, arts and sport. And today the city combines this heritage with a progressive vision to be a city that delivers surprise and delight in equal measures. Manchester city centre is jam-packed with unique and eclectic restaurants, bars, shops, museums, galleries, hotels and places to stay whilst the surrounding Greater Manchester boroughs offer a patch-work of visitor experiences including quaint market towns, traditional pubs and beautiful green spaces and waterways to be explored on foot or bike. The city region is easily navigated, with great transport links both in and around Greater Manchester. Furthermore, a packed calendar of world-class events and festivals – from the landmark Manchester International Festival to the enchanting Manchester Christmas Markets – mean there’s always another reason to visit Manchester. Whether you’re a die hard football fan, planning a visit with your family or on a weekend break to the great city of Manchester, enjoy a visit to the world's biggest and best football museum. The Manchester International Festival is an artist-led festival presenting new works from across the spectrum of performing arts, visual arts and popular culture. There’s always something new at Chester Zoo. And this year they’ve celebrated the BIGGEST baby boom on record, so go and see the new arrivals for yourself this October half term! The Lowry Hotel is a five-star contemporary hotel where Salford meets Manchester on the banks of the River Irwell. Opposite Piccadilly Train Station and host to the critically acclaimed City Café restaurant. Boasting the crème de la crème of what’s hot in fashion, food and beauty. Watch your favourite play in one of Manchester's stunning theatres. Inspired by a true story, Peter Shaffer's unique psychological thriller explores the complex relationships between worship, myth and sexuality. Telling the story of the imaginative and shy romantic with a gift for helping others, Amélie The Musical will tour the UK in a vibrant, re-conception of the production with new orchestrations. Enjoy a day trip to Chester, one of the UK’s most popular city destinations with cobbled streets, hidden cellars and quirky lanes to discover. Enjoy a trip to Chatsworth, the magnificent home of the Duke and Duchess of Devonshire, set in the heart of the beautiful Peak District National Park. There are 30 spectacular rooms to explore in the main house, and a 105-acre garden famous for its water features, sculptures and maze. This tour gives you a day in the UNESCO World Heritage site of the Lake District National Park, from Manchester. It’s an ideal way to see the villages, historic locations and scenery associated with this stunning National Park. 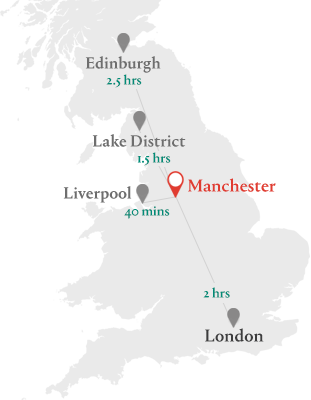 Travel to Manchester from across the North of England and Scotland with regular direct services TransPennine Express.